Applicants to the graduate program in studio art submit some materials directly to the department, and other materials to the UA Graduate School. Portfolio of 20 significant pieces representing your work. The portfolio must be a Microsoft Powerpoint slideshow on the CD. Each image in the slideshow must be in .jpeg format, no larger than 7.5 x 10″ at 72 dpi. Each image must include the artist’s name, title of work, date work was completed, dimensions (height x width x depth, as applicable), and medium. Three letters of recommendation on official letterhead (the letters must each be in a sealed envelope with the recommender’s signature across the seal on the outside of the envelope. Letters may also be submitted electronically using the Graduate School website online application feature. The Graduate School’s website, graduate.ua.edu, includes an online application and downloadable forms. Contact Sarah Marshall for a Studio Art Graduate Applicant Information Packet. The studio graduate program deadline for mandatory fall semester entry is February 10, 2018 (postmark date). 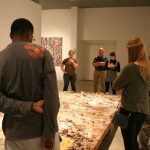 For more information about admission to the graduate program in studio art, contact Sarah Marshall, Director of Graduate Studies, Studio Art, smarsh@ua.edu. Conditionally admitted students, those on probation, and those in non-degree status may not hold assistantships without special permission of the Dean of the Graduate School. All graduate assistants must be full-time students. However, “full-time” means from 1 to 12 hours of graduate work, depending upon the obligations of the assistantship. A 1.00 full-time equivalent (FTE) assistantship award would represent a 40-hour work week. Minimum full-time enrollment loads for graduate assistants vary with the FTE of their awards. Maximum course loads are also recommended for each FTE level. The following table illustrates these limits. Any exceptions to these limits must be approved by the dean of the College of Arts and Sciences and the dean of the UA Graduate School.